never follow a hippie to a 2nd location: jew jew hooray! 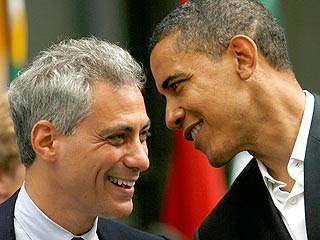 Rahm Emanuel will be the president's right-hand man in the new administration. The 48-year-old accepted the position as Barack Obama’s White House Chief of Staff on Thursday, according to the New York Times. A Democratic congressman representing his native Chicago since 2003, he earned his chops raising funds for Bill Clinton's White House runs and serving as an advisor. Known for his hard-charging personal style, he's also dad to three children, son Zacharias and daughters Ilana and Leah, with his wife Amy. But did you know he could have been pirouetting with the Joffrey Ballet? Read on for a briefing. • He's the real-life Ari's brother. His youngest brother Ariel (Ari) Emanuel is a founder of the Endeavor talent agency in Hollywood and was an inspiration for Jeremy Piven's character, Ari Gold, on HBO’s Entourage. Not to be outdone, Rahm is said have been a model for Bradley Whitford's character, Josh Lyman, on The West Wing. • He could have been a ballet dancer. He studied ballet as a teen and was offered a scholarship to join the renowned Joffrey Ballet, but went to Sarah Lawrence College instead. • He's missing part of a finger. In his youth, Emanuel badly cut a finger on a meat slicer while working at an Arby's. The wound became infected, and he lost half of the middle finger on his right hand. • He volunteered with the Israeli army. During the first Gulf War, he did a stint as a civilian volunteer with the Israel Defense Forces, rust-proofing brakes on a base in northern Israel. • He once sent a rotten dead fish to a political enemy. In the Clinton administration, his take-no-prisoners style earned him the nickname "Rahm-bo." I have officially posted a comment on Jen Simon's blog.